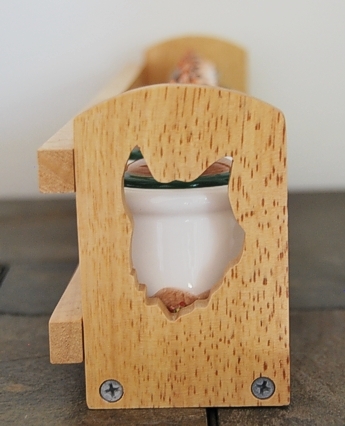 The Mexican Gray Wolf Spice Rack comes with a beautiful wood rack with a Wolf head carved out of the wood on each end. The 5 ceramic spice jars are decorated with cactus as that is where you will find lobo in the high desert of New Mexico and Arizona. 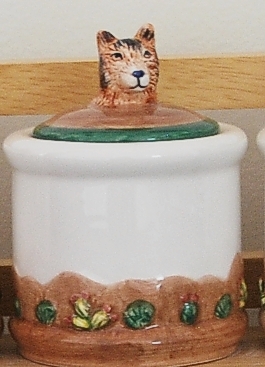 The lids to the jars each have a Mexican Gray Wolf head as a handle. The inside of the lid has a rubber seal to keep your spices fresh. Comes with metal teeth on each end of the back of the rack for easy hanging. This will make a great Wolf gift. Some assembly required.